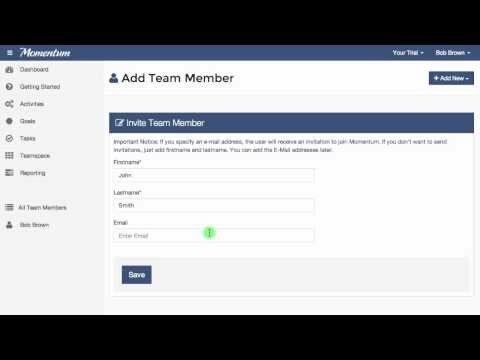 Momentum task management lets you list tasks and goals based on their priorities and assign them to certain members or groups of employee's for delivery. Momentum gives you a completely transparent view of all business processes with the ability to create unlimited tasks. Momentum also lets you create certain user permissions for members of staff to ensure tasks are being assigned correctly and workforce hierarchy is established. Momentum tasks allow your assigned employee's to add comments to certain tasks to log certain processes or issues - all updated in real-time. Momentum also comes with a free 30 day trial and 3 scalable packages that are month on month contracts. Based on your license, you will receive different levels of support from Momentum, from telephone to email support to online community. There are currently no reviews of Momentum. Unlimited projects, goals and tasks - With Momentum you can create as many business projects as you like and allocate them to individuals or group members. These Momentum tasks can then be assessed based on delivery time, the amount of people it took to finish and the resources needed for its completion. Momentum also lets you and the assignees add notes about the processes involved. Online support and resources - Based on your Momentum subscription, you will be provided with telephone support, email support and support through the online Momentum community. The Momentum free trial lasts for 30 days and can be upgraded at any time within this period. All Momentum packages are completely scalable and are designed to grow along with your company. Goals are transparent and goal priorities - Momentum gives you a full real-time view of what goals are being started, the finer details and how many have been completed. Momentum lets you move up and down the sprint what goals are required to be completed first and list them by their deadlines/delivery date. You can also create users permissions for others to take priorities over goal completion. Assessment and reports - All Momentum processes and goals show up in your Momentum backend reports. This allows you to assess the success of certain goals completed as well as manage employee efficiency and delivery time. Momentum lets you view a detailed view on all your analytics as well as the ability to view historical reports and export/save them. Below are some frequently asked questions for Momentum. Q. What type of pricing plans does Momentum offer? Q. Who are the typical users of Momentum? Q. What languages does Momentum support? Q. Does Momentum support mobile devices? Q. Does Momentum offer an API? No, Momentum does not have an API available. Q. What other apps does Momentum integrate with? Q. What level of support does Momentum offer? Q. Which apps is Momentum compared to most often?